John G. Aldous was a professor of biology at Dalhousie University. Aldous was Secretary of the Izaak Walton Club of Dalhousie University and wrote a historical account of the club in 1984. Aldous retired as Professor Emiratus. On the occasion of his retirement from Dalhousie University, his friends, colleagues, and students established an endowment to provide for an annual prize to be awarded for the best achievement in BIOL 4404 and BIOL 4407 combined. Account was written by John G. Aldous in 1984. The text includes colour prints of slides that originated from Alec McCarter. In 2013, Donald Gordon compiled the account and prepared it as a digital file using the Microsoft Word software application. The electronic file was sent to the University Archives in 2015 by Gordon's son-in-law, Kirk Yanofsky. 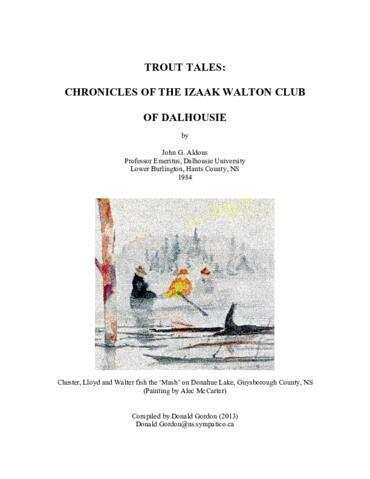 Item is an account of the Izaak Walton Club of Dalhousie University, written by John G. Aldous in 1984. The account chronicles the fishing trips and other activities of some prominent individuals in Dalhousie's history. The account was compiled by Donald Gordon in 2013. The original Microsoft Word file received by the donor is preserved in the University Archives. The file is available for viewing and downloading as a PDF/A. Archival description was created on September 4, 2015 by the Dalhousie University Archives.